VEE BEE Consistometer for Concrete Testing - The instrument is used for workability as well as consistency of fresh concrete. A slump Cone and a graduated rod supplied with the instrument helps the operator to find out slump values and vibration table with container and acrylic disc is used to find out workability of concrete expressed in Vee Bee degrees, which is defined as the time in seconds to complete required vibrating at which the fresh concrete flows out sufficiently to come in contract of the entire face of acrylic disc. Specification : The equipment consists of : A vibrating table size 380mm long and 260mm wide, resting upon elastic support at a height of about 305mm above the floor, complete with Start/Stop switch, cord and plug. A holder is fixed to the base in to which a swivel arm is telescoped with funnel and guide swivel arm is also detachable from the vibrating table. The divisions of scale on the rod record the slump of the concrete in millimeters. Supplied complete with a sheet metal container with lifting handles which can easily be fixed to the vibrating table. 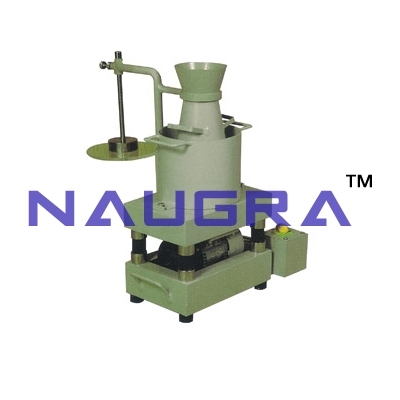 A slump cone open at both ends with lifting handles and a tamping rod of size 16mm dia and 600mm long rounded at both ends..
We are leading manufacturers, suppliers & exporters of VEE BEE Consistometer For Testing Lab for Concrete Testing Lab. Contact us to get high quality designed VEE BEE Consistometer For Testing Lab for Concrete Testing Lab for schools, colleges, universities, research labs, laboratories and various industries. We accept bulk orders for government tenders in all countries around the globe.